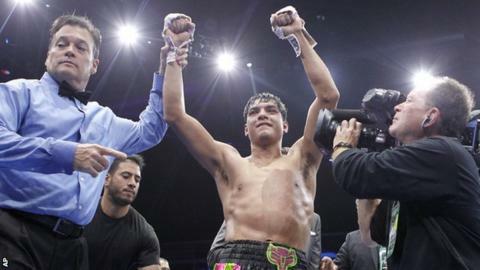 Ricky Burns suffered a unanimous points defeat by unbeaten American Omar Figueroa as the Scot made his US debut. Former WBO lightweight champion Burns, 32, was twice deducted points for holding and finished the non-title light-welterweight bout strongly. But he was well beaten on the judges' cards in Hidalgo, Texas, losing 117-109, 116-110 and 116-110. England's Jamie McDonnell retained his WBA bantamweight title by beating Tomoki Kameda on the undercard. The 29-year-old recovered from his first knockdown to score a unanimous points victory over his 23-year-old Japanese opponent. McDonnell was floored in the third round by a quick right hook but finished much the stronger of the two as he became the first man to beat Kameda. The Doncaster fighter won 114-113 on all three judges' cards. "I felt in control all the way through," said McDonnell, who has won 26 of his 29 fights. "It was a great performance." Burns, meanwhile, put in an improved showing but lost for the third time in his past four fights. The Scot took the first round as the hometown favourite started slowly, but Figueroa soon looked the busier of the two boxers. Burns landed a solid right in the fourth and was punching well at distance, but the majority of the fight was at close quarters with Figueroa, 25, making his uppercuts count. The referee deducted a point from Burns for holding in the eighth and 11th rounds, by which stage both fighters looked to be tiring. Indeed Figueroa, who had failed to make the weight, looked exhausted in the final round as Burns fired off shots at will, but he lacked the power to land hurtful shots. "We knew it was going to be a tough fight, but I didn't agree with the deductions for holding," said Burns. "I thought he was holding as much as me and that's why I had to tie him up." Figueroa, unbeaten in 26 fights, said: "I'm a very offensive fighter, so the holding kind of slowed me down. I tried to do what I could and, thankfully, the judges saw that."